It is very important to explore the alternative to back surgery before jumping in and going under the knife. In fact, 92% of back injuries and degenerative spine conditions can be fixed by alternative measures. If back pain has become a part of your daily life for more than three weeks, you may have something worse than a muscle strain. This debilitating condition may be a sign that your spinal nerve is being compressed by your discs. In this case, you should take immediate action before your condition worsens. The sooner that you see a specialist, the higher the probability that your back will respond to nonsurgical alternatives to back surgery. Back pain is one of the most common neurological conditions—second only to headaches. Back pain is not only distracting and uncomfortable, but it can also severely interfere with day-to-day activities and your interaction with family and friends. For all of these reasons, it is not a surprise that many people are looking for a quick fix to their back pain and consider back surgery to be the solution. It’s important to understand that back surgeries are not a quick fix for all back pain, and anyone considering spinal surgery should explore alternatives to back surgery for an extended period of time before deciding to undergo surgery. Most degenerative spine conditions are manageable using a combination of nonsurgical alternatives to back surgery. Surgery should be deemed a final option but may necessary if your condition is severe and has not been dealt with sooner. The following is a list of nonsurgical alternatives to back surgery. Because inflammation is a major component in acute and chronic back pain, injections of steroids near the spinal cord as an alternative to back surgery can significantly reduce this inflammation, which not only reduces pain but may also aid the body in healing itself. These injections are usually applied as part of a more extensive treatment plan, which may include exercise to improve stability and mobility. Injections to the spine are done using fluoroscopy, which uses a contrast dye and x-ray technology to ensure the medication is injected into the proper location. For pain that starts in the spine and radiates to the legs or arms, epidural injections are used to alleviate nerve inflammation or compression (a “pinched nerve”). Facet joint injections are used to address injury or degenerative or arthritic conditions. They can be applied to the neck or middle or lower back and can alleviate pain that has also radiated to the legs, buttocks or shoulders. Sacroiliac joint injections can also be performed to manage pain. The sacroiliac joints between the sacrum and the ilium (pelvic) bones can cause pain in the legs, buttocks and lower back. It is common for this pain to be present in only one side of the body. Injection alternatives to back surgery are usually considered after physical therapy and medication but prior to surgery. Acupuncture is one of the most common and natural alternatives to back surgery. Acupuncture is the application of small, specialized needles to specific points on the body to aid in natural healing. It works with the natural energy flows of the body to stimulate the nervous system and the natural production of chemicals within the body that operate as painkillers, such as endorphins. Sterile acupuncture needles are much smaller than medical hypodermic needles, so most patients do not feel sensation during acupuncture beyond a minor prick and occasionally a tingling sensation. Needles are left in for about 20 minutes. Five or ten treatment periods should be pursued before making a final decision about the efficacy of acupuncture for your pain management. Acupuncture alternatives to back surgery are normally pursued as part of a more comprehensive treatment plan that may involve medication or physical therapy. Using medication alternatives to back surgery can be helpful if you are experiencing a high level of inflammation. 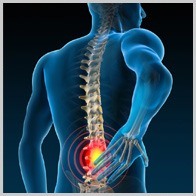 Inflammation is a common symptom of a back or spine injury. It is a natural response of the immune system but can become a problem in itself if prolonged over a period of time. By addressing this inflammation through non-steroidal, anti-inflammatory drugs, the pain and irritation can be reduced. However, it is important to note that this only temporarily manages pain and does not treat the cause of the pain. Inflammation is also a natural healing process, and interfering with this process is not always considered best practice. Both hot and cold therapies are used to manage pain and improve blood flow to the affected area. Cold therapy is best used on a recent injury to reduce pain, redness and inflammation. In cold therapy, the blood vessels constrict and pressure in the area can be reduced. After the source of cold is removed, blood circulation will return to normal and replenish the area with fresh blood that will aid the healing process. Heat therapy is most often used for long-term injuries to increase blood flow in an area and stimulate healing. Sometimes hot and cold therapies are alternated to further stimulate blood flow and healing and temporarily reduce discomfort. Cold therapy should never be continued for more than 20 minutes, and sources of cold or heat should never be applied directly to the skin. These alternatives to back surgery can be a quick-fix and can alleviate a lot of inflammation, but if you use this as a method for more than a month with no change, it is time to explore other options. Depending on your spinal condition, massage may be an effective treatment option for back pain and discomfort. After a consultation and diagnosis with some of the best spine surgeons in San Diego, a massage from a qualified massage therapist who is familiar with spinal conditions may be a part of your treatment plan, along with other alternatives to back surgery. Many often overlook the power of the body to heal itself. If you sustain a back injury, it is important to allow the muscles to heal before putting them under the same stressors that caused the injury. However, extended bed rest that may allow your muscles to deteriorate is not encouraged. A proper balance of rest and exercise is ideal. If pain continues for 2 to 6 weeks, physical therapy may be a treatment option. Physical therapy involves passive or active therapies or a combination of both to address sources of pain and the overall musculoskeletal structure as it involves the pain source. Passive therapies may include cold, heat, traction and electrical stimulation. Active therapies include stretching and strengthening exercises to produce improved function. Education is also an important component of physical therapy to ensure patients utilizing proper posture and lifting positions.